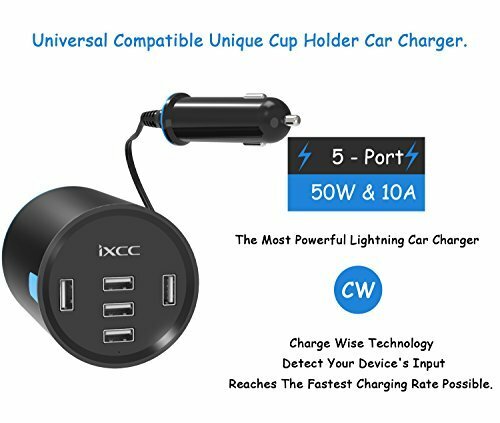 5 Port Usb Car Charging Port Featuring Universal Adapter Compatible with All Standard Lighter Socket, Perfect for Family Road Trip, Photographer, Outdoor Online Streaming, Gamer. 50W & 10A and ChargeWise Deliver the Fastest Possible Charging Rate Up to 2.4A Per Port Reaching Your Device’s Maximum Power Rating.With 5 Devices Plugged in, The Battery Still Goes Straight Up While all Phone is on GPS Navigation and Music Tuning. 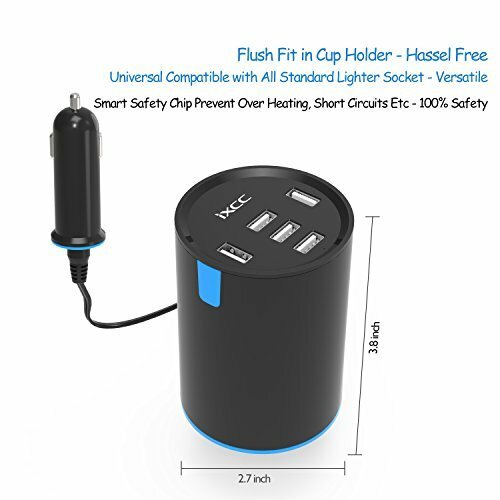 Safety First Design Philosophy Adopting Premium Safety Chip to Prevent from Over-Voltage, Over-Current, Short Circuit, Excessive Charging Etc. 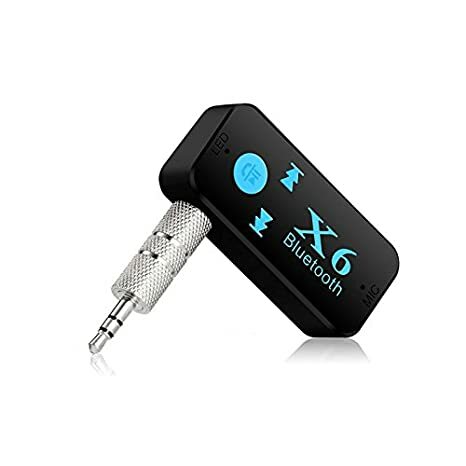 Universal Compatible with All 5V Powered Devices Apple iPhone 7 / 6 / 6s / Plus / 5s / 5 / SE, iPad Air 2 / Pro / mini 2 3 4, iPod touch / Nano; Samsung Galaxy S8 / S7 / Edge / Note; kindle, Nexus and more. Does Not Support Qualcomm QC 3.0. Fit Right in Cup Holder, Won't Wobble, Package Include: 1 x Car Charger, 18 Months Warranty. Charging Cable is a great factor regarding charging rate, Please Use Certified Cable. 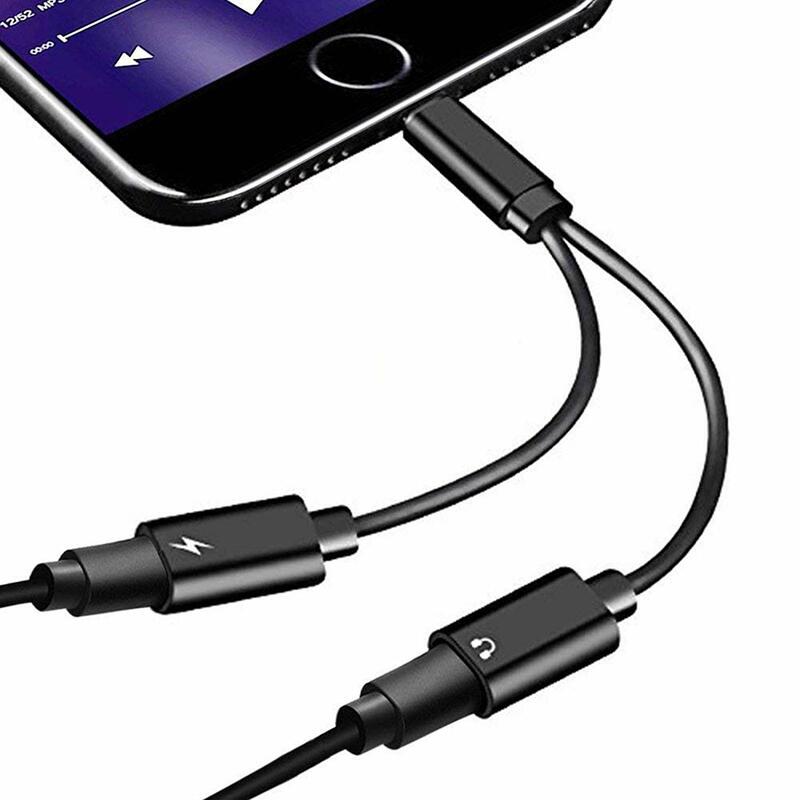 PS: All iXCC Lightning Cable and iXCC USB Cable is 100% Certified. In this day and age of having multiple USB devices that need to be charged at once, this USB charger stands alone. 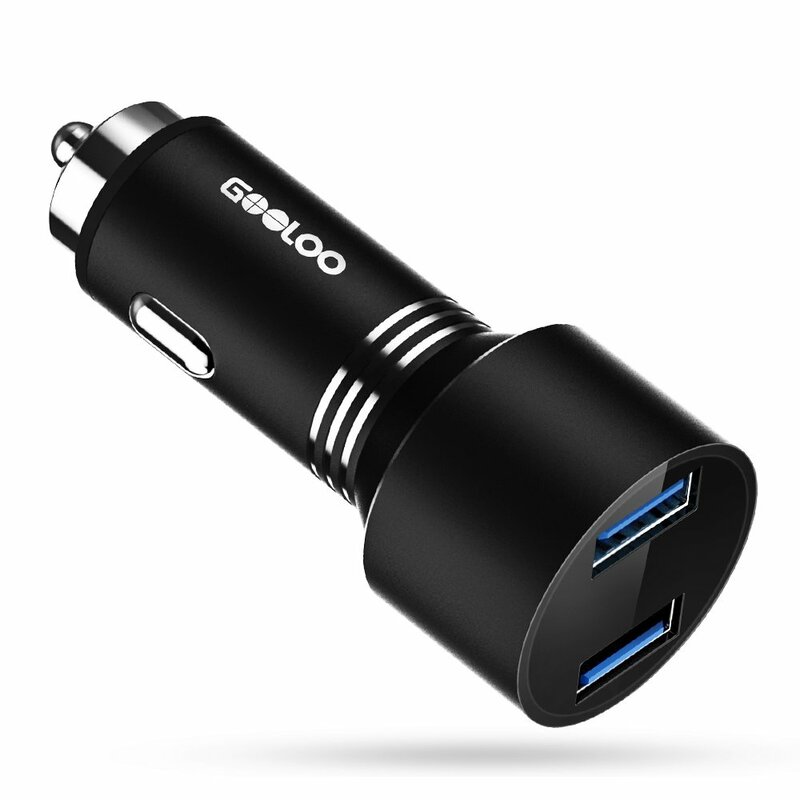 I have tried many different USB car chargers but so many of them are bulky and take up more space than they're worth. I drive for Lyft and Uber and needed to be able to charge my two cell phones, plus provide a charging port or two for my riders. This fits perfectly in the cup holder in my Audi A4. The retractable cord is a unique feature, allowing you to have only as much cable exposed as needed. My only complaint, and it's a small one, is that the cable could be a little longer. My A4 has two cigarette lighter ports, one of which blocks the use of a cup holder when used. It's a horrible design flaw on the part of Audi. The other one is in the ashtray, which I like to keep closed for a neater appearance. I hardwired a three port cigarette lighter port under the dash and ran this charger to it. That's why I wish the cable for this was a foot longer. 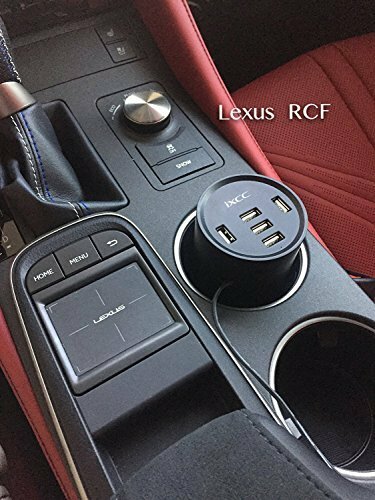 We needed a car charger that could handle 2 ipads, iphone7, S7 and S6 during long road trips. We have 3 kids and they each like to have their own device playing while we go on vacation. So we needed a charger that could charge everyone's device and keep them charged while on the road. This charger works perfect for that. Other chargers we've had would not charge as well or you could only plug 1 or 2 devices in max and they wouldn't charge unless they were off. This one will charge while all 5 devices are on and playing videos. Highly recommend to anyone who needs a good charger to charge up to 5 devices. With the retractable cord it reaches our cup holder and fits perfect in the cup holder. 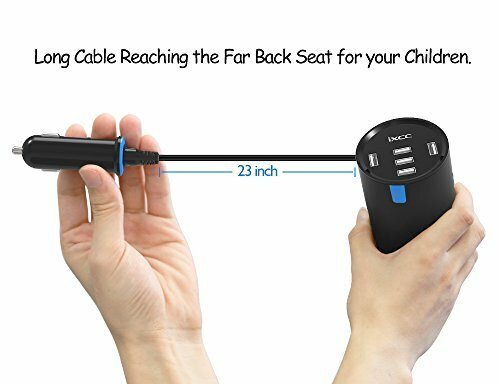 We grabbed a couple 10ft cords to reach the back seats so kids have uninterrupted playing time on the ipads or iPhones while on long road trips. The price is also great. This fits neatly in either our cup holders or the small cubby in the front of our Grand Caravan. My husband and I used to banter about who got to use the charger so this solves that issue. Also, since he got his new phone the charger that came with it is quite stubby and his phone basically hangs from it when it's plugged in. 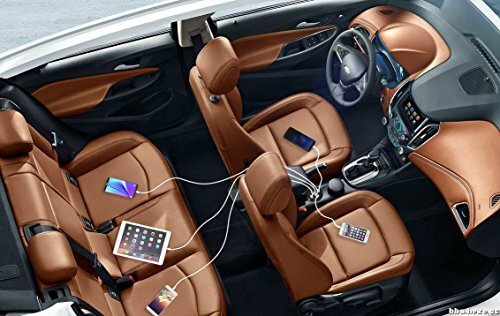 This device makes it so that he can plug it in and set it in a cup holder or on the little organizational area between the front seats rather than worrying about it dangling from the lighter port. We haven't noticed any loss of charging power with more than one device plugged in at a time; in fact, just last night my husband's phone went from dead to 45% in about 20 minutes while plugged into this thing and he mentioned that he thinks his phone was charging more quickly while plugged in to this hub than it does when plugged into the wall at home. 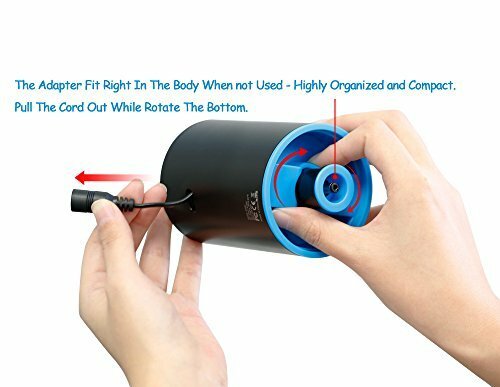 I like that if we decide to store it for some reason, the part that plugs into the vehicle can be stowed away inside of the device itself so that it won't be lost (similarly to computer mice that have little niches inside the battery compartment for the USB piece that plugs into the computer). All in all, we've really benefited from having this product and I have no regrets. This review is for the iXCC® 5 Port USB charger. There is a lot of thought in engineering this charger. 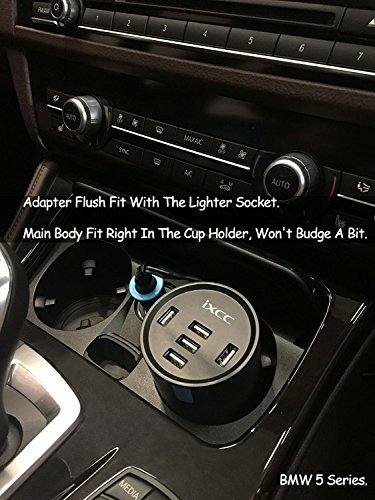 Cup holder fit, self-storing retractable power cable, and cigarette lighter adapter that stores in the bottom of the charger. We purchased this for use while traveling in an RV. We have 3 cup holders in our Class C motor home console and this take up one of them perfectly. Five charging ports is great when you have family wanting to charge several devices. The power cord extends only as far as needed to reach the lighter output. Very compact for storage and perfect for the RV. I have to admit that this was so well designed that I sent the first one back because "it was missing the cigarette lighter adapter". When Amazon replaced it, it was the same. iXCC customer support was courteous and quick (very quick) to respond to my concerns, advising me that the adapter was in the bottom of the charger. This could also be used on AC household outlets using a AC to 12v cigraette lighter adapter. Considering the design features, genuinely great customer service, and 18 month warranty, I am confident this will be an excellent purchase. This review will be updated over time. This charger is awesome and extremely convenient to have for road trips. We bought this because we travel frequently to visit family hours away and we tend to use electronics on the way to help pass the time. I love that it has 3 USB plugs for all of us to be able to charge one device of our choosing. It keeps Mom, Dad & teenager happy and connected to our navigation & entertainment easily and at an arms reach. I am happy with the way it has held up to our rough treatment and many long road trips. I’d absolutely purchase this item again. I liked the overall idea of this product and how it is compact but still provides charging for up to 5 devices. 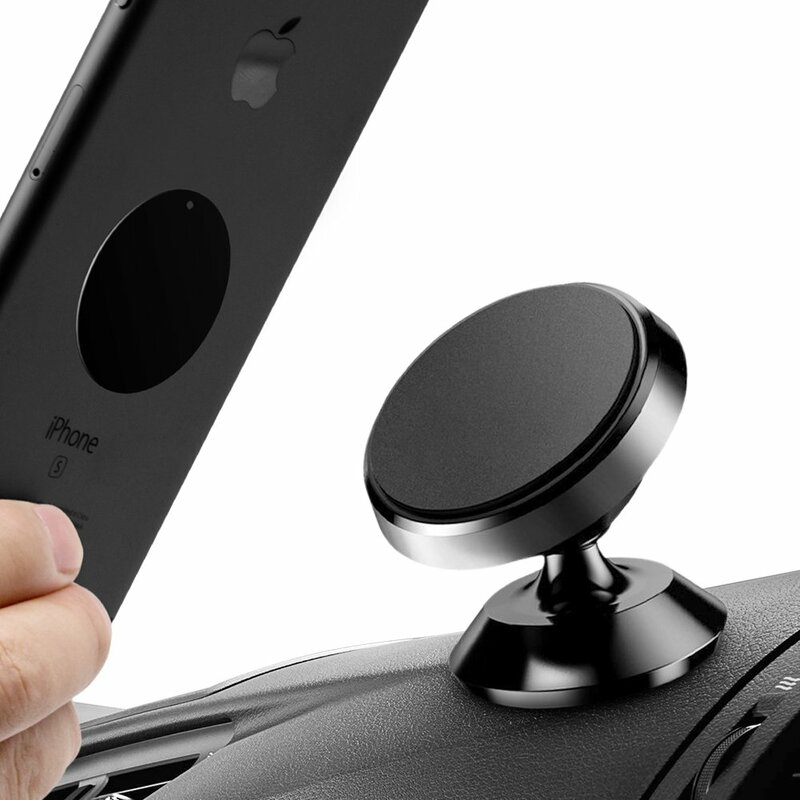 I also really liked how you could wind up the car adapter for easy storage and you won't lose the cord either. Unfortunately, I didn't feel that the charger charged my devices very effectively or fast. Even with just my phone plugged into it, it took a very long time to charge it, so I can only imagine how slow it would be with all 5 ports plugged in (I didn't have that many devices/charging cables to try this out). I also did not like how it doesn't come with any charging cable, so you have to provide them for all the devices you want to plug into it. 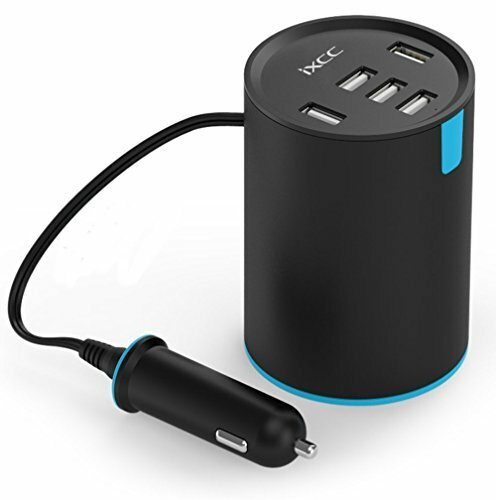 I like that it is light and compact, and a good alternative if you have multiple devices to charge in the car (up to 5- which is great! 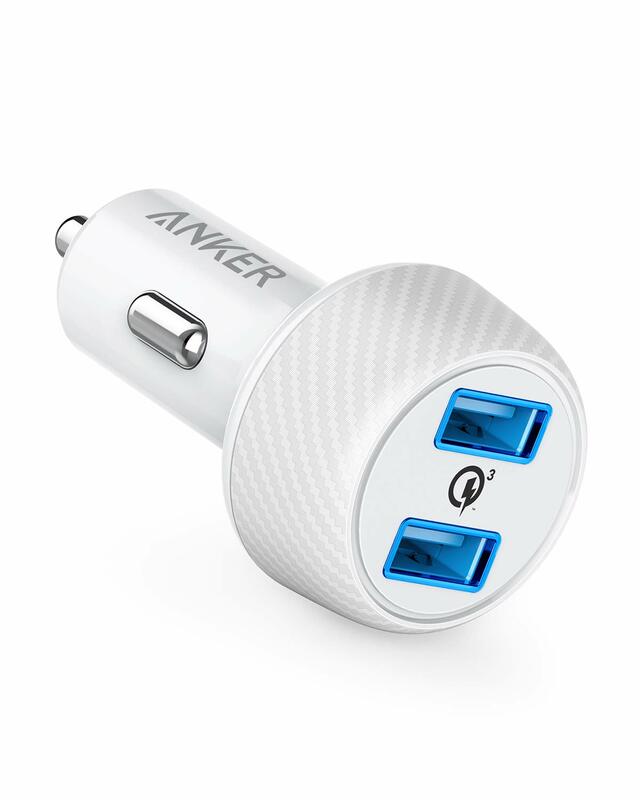 ), but I probably wouldn't use this as my primary car charger everyday. It is more of a charger that I would use if on a long road trip with multiple people who all need to plug in their devices. Disclaimer: I received this product to test and provide honest feedback to the company, but was not required to write this review. As such, my review was not influenced by any outside source in any way and all opinions expressed here are my own.